Eid-al-Adha also called the “Feast of sacrifice” is celebrated by Muslims worldwide each year. In the Islamic lunar calendar, Eid-al-Adha falls on the 10th day of Dhu al-Hijjah. The word ‘Eid’ is found in al-ma’ida, the fifth sura of the Quran meaning “Solemn Festival”. On this day All Muslim families, friends even the enemies come together & celebrate. They make especial lunch and late breakfast. 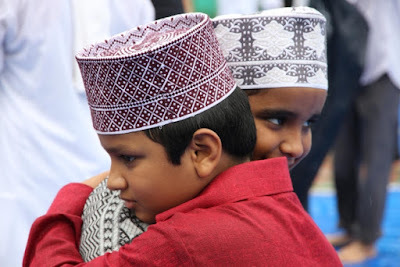 They wear neat and clean clothes & celebrate Eid-al-Adha by giving gifts to each other as a token of love. They help the poor by giving money, food, sweetmeats and clothes in the name of zakath. There was a man named Ibrahim known for deep faith in God and God also had immense faith in him. Ibrahim and his wife Sarah did not have any children. So, god promised to both of them that he would soon bless them with a child. After many years when Ibrahim was 100 years old and his wife almost 90, God fulfilled his promise and Sarah bore a son in her old age, at the set time God had told them. Ibrahim named his son, Isaac. After many years, God tested Ibrahim (Abraham) by asking him to go to the land of Moriah; and kill his son for an offering upon one of the mountains. Subsequent day, Ibrahim woke up early in the morning, loaded his donkey, and took two of his two young men with his son Isaac and set out for the place God had told him about. His wife, Sarah had no idea about it. After three days, Ibrahim came upon the place. He asked both servants to stay with the donkey, and proceeded with his son to the sacred place. When they reached the place, Ibrahim built an altar and arranged all the wood on it. He bound his son Isaac and laid him on the altar, then took a knife to kill his son. At that very moment angel Jibra’il (Gabriel) of Lord called out to him from heaven and asked Ibrahim to not kill his son. They believed then that his faith in God was insurmountable. Ibrahim then looked around and in a bush saw a ram (Sheep). He then took the ram and sacrificed it as an offering instead of his only son. The meat of ram was then divided into three parts, the family retained one third of the share, another third part was given to relatives, friends and neighbors, and the remaining third was given to the poor and needy. Muslims have thus been celebrating Eid all over the world since the time of Ibrahim’s act of sacrifice. They too on this day sacrifice ram, lamb, goat, sheep, cow, buffalo or camel just like Ibrahim did. They respect this pious day when Ibrahim (Abraham) was willing to sacrifice his only son, as an act of submission to Lord’s command.